The Pilgrim nuclear power plant. The company that owns Pilgrim Nuclear Power Station said Wednesday that it intends to sell the aging Plymouth facility to a New Jersey company that has promised to decommission the site in eight years, well ahead of the 60 years allowed by federal rules. In a statement, Entergy Corp., a Louisiana energy conglomerate that has owned the plant since 1999, said it had agreed to sell the operating license to Holtec International, which specializes in the storage and transportation of nuclear waste but has never owned or decommissioned a nuclear plant. 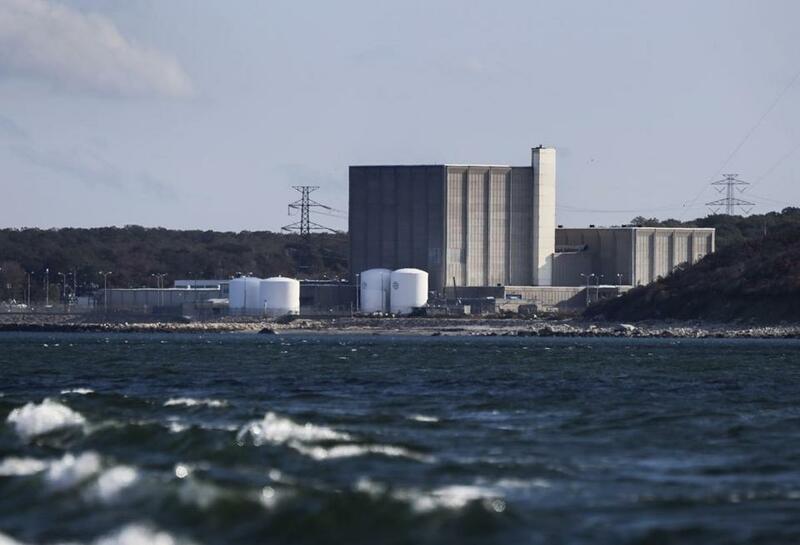 In exchange, Holtec will take over the 1,500-acre campus overlooking Cape Cod Bay and assume control of Pilgrim’s nuclear decommissioning trust fund, which has more than $1 billion. Holtec, which plans to subcontract the work, could earn a profit by decommissioning the plant for less than that amount. The sale won’t occur until at least next June, when the 46-year-old plant is scheduled to close. The deal is subject to review by the Nuclear Regulatory Commission, which oversees the nation’s nuclear industry, and other agencies. Officials at Entergy, which would be paid an undisclosed amount for the sale, said the transfer would accelerate the decommissioning process. “Earlier decommissioning benefits the surrounding communities,” Leo Denault, the company’s chief executive, said in a statement. Holtec officials said they expect it will take about three years to remove the spent nuclear fuel from Pilgrim and store it in dry casks. Pilgrim already has stored nuclear waste in eight massive, steel-reinforced concrete cylinders. Officials expect to fill another 54 of the casks, which will remain in Plymouth until the federal government finds a permanent storage place. Holtec officials said they would subcontract the decommissioning work to Comprehensive Decommissioning International, a newly formed company based in New Jersey that is jointly owned by Holtec and SNC-Lavalin Group, a Montreal construction company. SNC-Lavalin Group has experience decommissioning nuclear plants. “We intend to deploy cutting-edge technologies to carry out the deconstruction of the plant structures with minimal impact on the environment and maximum personnel safety, which are our core competencies,’’ said Kris Singh, president and chief executive of Holtec, in a statement. Holtec will be required to submit a post-shutdown decommissioning report and cost estimate to the NRC, outlining its plans to close the plant and protect the nuclear waste. Local environmental advocates who have long opposed the nuclear plant said they worry that the new owner could place profit above safety. Senator Edward J. Markey also raised concerns. The deal also includes the sale of Entergy’s Palisades Power Plant in Covert, Mich., and its decommissioned Big Rock Point Nuclear Power Plant near Charlevoix, Mich. Entergy has also sought NRC approval to sell its shuttered Vermont Yankee nuclear plant to NorthStar, a New York decommissioning company. No nuclear plant in the United States has been sold while going through the decommissioning process, Sheehan said. The proposed sale comes as Pilgrim continues to generate controversy. In recent years, the plant has experienced a litany of economic woes and safety issues. In 2015, the NRC designated Pilgrim as one of the nation’s three least-safe reactors, and earlier this year, the plant went offline for 43 days — one of its longest unplanned outages — after crews discovered a significant issue with a power transformer. The plant has also raised concerns about the proximity of its stored waste to the ocean and alarmed residents last month when it requested that the NRC allow it to end a required emergency-planning zone around the plant. There’s also the question of what will happen to the plant’s spent fuel. Federal officials had long planned to store the waste in a multibillion-dollar repository bored deep into Yucca Mountain in Nevada. But state officials and residents blocked the site from opening, saying it poses a risk to public safety and the environment. Federal officials have been reviewing other options, including temporary facilities elsewhere in New Mexico or Texas. But those options have similar problems — the government would have to overcome local concerns and the challenges of transporting the fuel through a variety of jurisdictions. Some local opponents of nuclear power noted that Holtec has been pushing the federal government to approve an interim storage site for nuclear waste in New Mexico. But others said they’re hopeful that Holtec can live up to its promises, especially as sea levels rise in the coming decades. John R. Ellement of the Globe staff contributed to this report. David Abel can be reached at dabel@globe.com. Follow him on Twitter @davabel.